In 2010 it was the turn of the Czech Republic to host this prestigious event from 11-19 September. Individual events were played on a knockout basis. Matches in individual events were the best of 7 games, except doubles events up to the quarter-finals, which were the best of 5 games. There was a maximum 128 places in the 1st round proper of the singles events and not more than 64 places in the 1st round proper of men's and women's doubles events. Qualification rounds were in groups of 3 to 8 players using a knock-out system. The organising Association could enter up to 16 players, consisting of not more than 10 men and not more than 10 women. Any other Association could enter up to 10 players, consisting of not more than 6 men and not more than 6 women. Within these limits different players could be entered for the team events and for the singles and doubles. Seeding for team events was on the basis of the final positions in the previous European Championships. Seeding for individual events was based on the last European Ranking List published before the championships. Seeding for doubles events was on the basis of a seeding list prepared by the Ranking Committee. 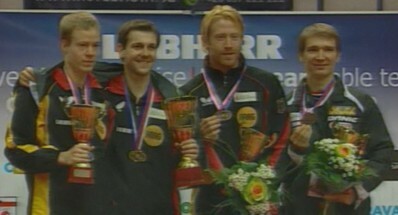 The last European Table Tennis Championships were held in 2009 in Stuttgart, Germany and the winner was Michael Maze of Denmark and the runners-up was Werner Schlager of Austria. Unfortunately, Michael Maze was unable to defend his title in 2010 because of injury.